Bentley Systems, just unveiled Bentley’s Subsurface Utility Engineering (SUE) based on OpenRoads, Bentley’s collaborative BIM innovation for interdisciplinary civil engineering projects. This newest application is designed for the incorporated engineering management of underground utility systems concerning water, storm water, gas, and electric services. Bentley’s SUE combines data collectively from various resources and geo-coordinates it for 3D modeling, interactive inspection, and utility conflict finding and clash settlement. SUE contains compelling software tools & wealthy content to produce high-fidelity, intelligent 3D feature-based models regarding covered construction area instantly and smoothly. SUE alleviates the hazards of building in utility-packed, “call-before-you-dig” underground locations. SUE opens a new horizon for information modeling and information mobility to understand and resolve underground infrastructure clashes efficiently amid new construction features and existing utilities throughout the design stage which result in improving the consistency, security, and performance of infrastructure assets. SUE automates the process for generating 3D models from survey information, CAD data, GIS, Excel spreadsheets, Oracle databases, and other industry approved sources of information. 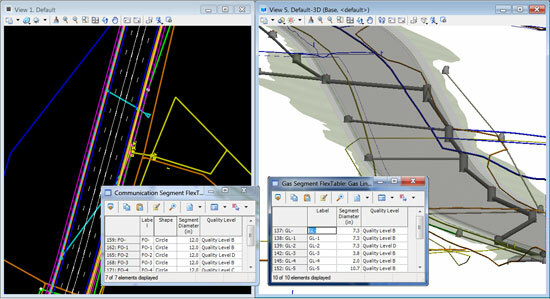 Besides, it keeps ups a relationship connecting CAD and GIS utility sources and finds out civil features for co-ordination and updating of data effectively. SUE allows immersive modeling by integrating active plan, profile, and cross-section views through ground-breaking 3D modeling technology that can produce supplementary framework for decision making. SUE comes with parametric design features like completely dynamic rules, relationships, and constraints built into the modeling workflow. The quality of design is greatly enhanced through exclusive “optioneering” abilities facilitating the users to make and compare design options quickly. SUE presents essential insight for contractors using alternative delivery approaches like design-build, and accepting the risks relating to recognizing and resolving subsurface utility conflicts.